Welcome to the Trail Well Traveled! Each Friday, in partnership with Montana Wilderness Association we will feature a new western Montana trail and then give you some helpful details and tips to get on your way! This weekend, head south into the Anaconda-Pintler Wilderness for a loop with great scenery. But for this be sure to call the local ranger district before you go – the roads can sometimes get snowed in! Directions: From Missoula, you can get their either via Philipsburg or via Hamilton. For the former, just head east on Interstate 90 and then depart onto Highway 1 south at Drummond. Five miles past Philipsburg you’ll turn right onto Highway 38 (Skalhako Highway) for about 6 miles. There, turn left onto the gravel Forest Service Road 5141 for the final 12.6 miles to the trailhead. And for the latter, head south on Highway 93 to Hamilton and then take Highway 38 (Skalkaho Highway) east for about 48 miles to Forest Service Road 672. There, turn right and drive another 5.5 miles to its intersection with Forest Service Road 5141. Continue straight through the intersection for the final 12.6 miles to the trailhead. Note: There is no outhouse at the trailhead, but there is water about a quarter-mile down the trail. Also, the trailhead is a large loop, so there is plenty of room for trailers to turn around. What to expect: The trail begins behind the trailhead sign. Just 1/4 mile down the trail, cross a sturdy bridge across Carpp Creek and then climb a short distance to a T-intersection. There, turn right onto the loop – an abandoned road named Trail #24, which heads towards Carpp Lake but returns from the other direction. The trail descends slightly for about 1 mile to an intersection with Carpp Lake Trail #110. Turn left again; the trail is now narrower and steeper. You will cross a stream on a bridge just before Lower Carpp Lake, 2.7 miles from the trailhead. Perhaps pause here to take in the view, and then continue the final 1/4 mile past Lower Carpp to Middle Carpp at 3 miles. Middle Carpp has a handful of established campsites on the shore, a few large rocks for picnics, and grassy meadows for relaxing and taking in the view. Continue following the trail another 1.5 miles up to Upper Carpp Lake, where the first alpine larch start to appear. This next stretch is stunning in September, when the larch turn golden. Campfires are prohibited within 1/4-mile of the lake and camping is discouraged due to the fragile ecosystem. Relax here, or follow a final short section of switchbacks up to Warren Pass. Sparse alpine larch prevent perfect 360-degree views from this high point, but the trees are beautiful and the surrounding, towering peaks are stunning. Crossing over Warren Pass and into the valley below, the trail descends on a couple switchbacks and then suddenly disappears in the meadow. Keep a close eye here to find the well worn trail. 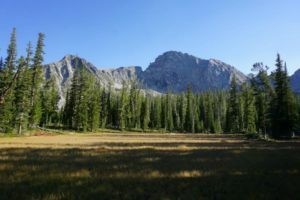 The trail passes through a few open meadows with views back towards the base of Warren Peak. After Bear Meadow, look for the final junction, turning left onto Trail #24 to return to the trailhead. This final 1-2 miles again follows the old road, which is hard packed dirt and loose rock. Arrive where you began, turning right to cross Carpp Creek and continuing 1/4 mile back to the trailhead. Learn more about this trail, file your own trip report and photos, or check out some other great hikes at hikewildmontana.org. And don’t forget to tune in to the Trail 103.3 each Friday at 9:45 am for the next featured trail and your chance to win! Big thanks to Rangitsch Bros RV for sponsoring the Trail Well Traveled. Proudly serving Missoula for over 56 years, whatever camper best suits your needs Rangitsch Bros has got it!